Teachers read the following information to your students, then do the board work included in the next section. What is a metaphor? Have you ever been told you are a an angel or maybe something not so nice as that? That is a metaphor. Metaphors state that one object is the same as another, unrelated object. A metaphor state that these two things have some common ground. A good example is "Tom is a bum." Tom is not really a bum, but perhaps what the speaker means is that Tom is lazy or avoids work. The literal interpretation of what the speaker actually said is, "Tom and a bum are both lazy." We use metaphors everyday to express our opinions. Sometimes metaphors are used in a not so nice way, like name calling. Now that you know what a metaphor is, we are going to test your knowledge on the board! Teachers, write the following statements on the board. Ask students to finish the statements and/or explain what they mean. Once the board work is complete, ask the students to look at the person next to them and come up with a complimentary metaphor about them. 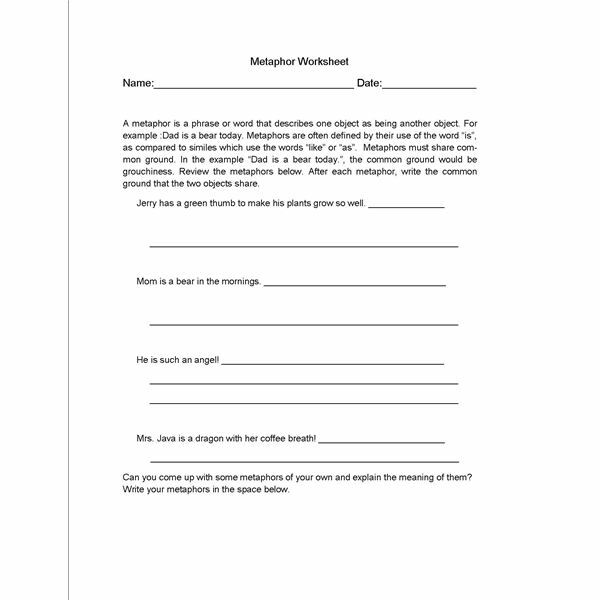 Then, pass out and ask the students to complete the Metaphor Worksheet.